Top Speed: 120 km/h but it is typically run at 64 km/h in most parks, at wonderland it ran at 50km/h. 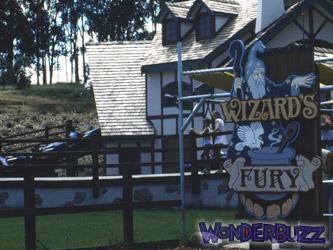 Wizards Fury was a "Bayern Kurve" ride, riders sat in one of the sixteen bobsled-themed cars that traveled at a high-speed around a circular single-hilled track that went through the "Wizards House" and back again, about 20 times per cycle. Riders start in an upright position and as the cars pick up speed, they tilt inward toward the center of the ride. This ride is also known for its distinct whine that increases with speed due to its tire/blade drive. It was very VERY noisy, and quite old, it was designed in the late 60's and installed into Kings Island in 1973, removed in 1985 and sold to Wonderland. In 2002 the Train and track where demolished because of rust in the train, The Wizards House was not demolished, the ride pad was later used for Galleon's Graveyard.